Google showed off the AR-enabled Google Maps at Google I/O 2018 and it looks like the feature is almost upon us. Google first showed off AR-enabled Google Maps at I/O 2018. The new UI offers information about landmarks, popular locations and streets. There is no news on when the feature will launch to the masses. 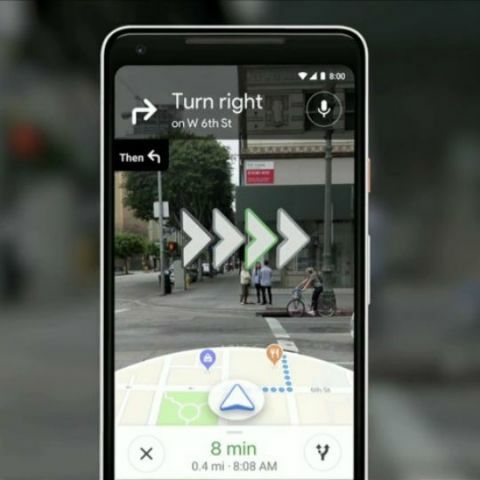 At I/O 2018, Google showed off the ability to use Augmented Reality to navigate using Google Maps. The Augmented Reality (AR) part of maps let users identify landmarks and more in real time. The Wall Street Journal spent some hands on time with the app. Access to the new feature will be given to Local Guides first. Local Guides is the community that reviews places for Google and provides feedback on them. If you have noticed, Google does give you a popup to provide a review every time to visit a place or a popular landmark. You also have the option to answer some helpful questions about a place. The AR mode in Google Maps kicks off when users press a specific button. How Google Maps traditionally works is that it uses a combination of GPS, mobile towers and Wi-Fi to identify your location. When you start moving in a particular direction, the blue dot becomes an arrow and you realize the direction you are moving in. This could sometimes be the wrong direction. With AR, you will not only get faster response to the direction you are moving in but also information about key landmarks and places along with street names. According to the WSJ, the app is aggressive in trying to save battery of the smartphone. When you put the phone down, it will go to the traditional view of maps. Lift it up and you will see the AR interface come up along with the same white dots you see in the Google Lens app as it tries to identify landmarks around you. The app is of course intended for use when walking only as using the AR feature when driving can get quite distracting. As far as the layout is concerned, the top two thirds of the display is dedicated to the AR view with the bottom third giving you the traditional maps view showing you the direction you are walking in. The directions and landmark icons appear really large in the AR mode and this is of course so you don’t miss them on screen. According to 9to5Google, Google “also laid out ideal use cases, like well-hidden alleys or complicated intersections. At this stage, Google is not advocating that this be the primary way you get around but rather something that integrates to your usual commute”. There is no information when Google will roll out AR-enabled Google Maps to the masses.